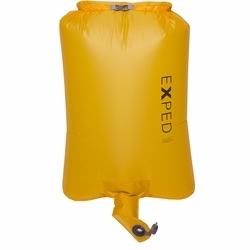 Exped Schnozzel Pumpbag UL. Doubling as an ultralight waterproof stuff sack, the Schnozzel Pumpbag UL is used to inflate Exped mats without integrated pumps. Dimensions: M - 27.2 x 15.4 x 6.7" | L - 27.2 x 19.7 x 13.8"